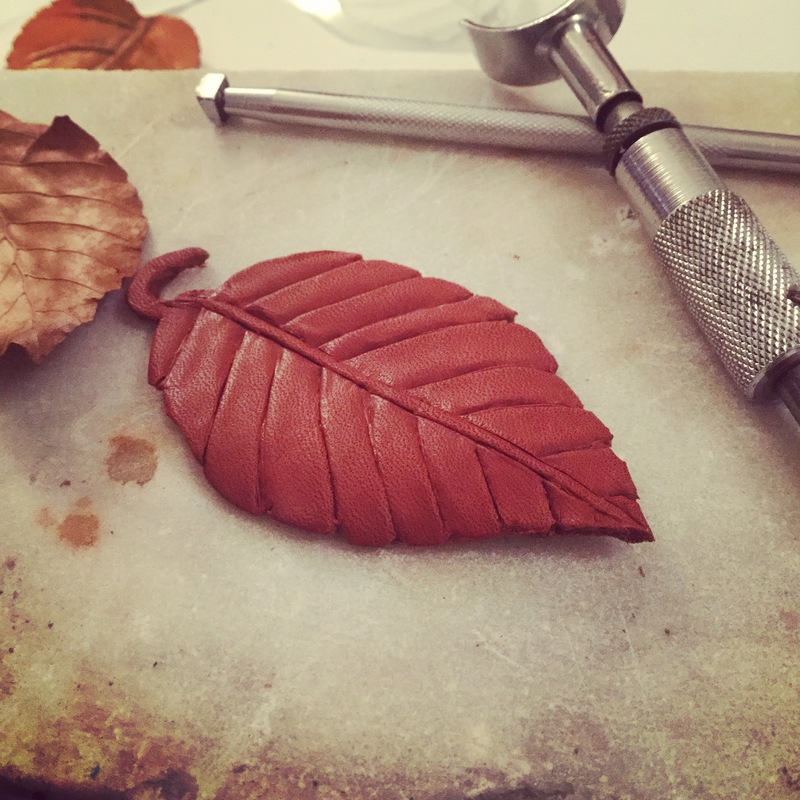 I wanted to show you the process of how I make my leather leaf brooches. I have divided this so I could give more visuals. Today is basically a list of what you need and I wanted to show you the tools I use for this. 1) Leather – 8 ounce leather would be good. Not pre-stained and treated leather because this doesn’t absorb the water that we use to make the leather more pliable and possible to carve and tool it. Not very thick because that makes it hard to cut the outlines, but not too thin so that you can’t create texture on it. 2) a metal stylus (one for heavy duty crafting) or a pen that has run out of ink or something pointed but not too sharp. 3) a piece of transparent waterproof paper, you could use the transparent plastic paper from inside a cereals box. 4) a pen or a permanent felt tip. 5) a sharp craft knife. 6) a leather swivel knife, or you could possibly use a pen without ink and push down hard. 7) a leather beveler tool, to press down and give depth along one side of the veins of the leaf. The impression this gives is like this photo. 8) a hammer, preferably a wooden ended one or a rawhide mallet. 9) a pear shader tool, to give depth and texture. It looks like this when hammered down. If you have access to a couple of different sizes it would be useful. 10) a V shaped beveler would be useful too. 11) a jar or glass of clean water. 12) a fluffy brush to wet the leather. 13) If you want to add some colour – leather paint, for example Eco leather paint or Acrylic paint. 15) A product to seal and give shine to the leather after you have finished carving and tooling it. I recommend Eco-Flo Super Shene. 16) A clean rag or cloth for buffing and polishing. 17) Leathercraft glue or flexible super glue. 19) a piece of marble or a special thick silicone block to hammer the leather on. 20) A mat or board for cutting on. 21) a real leaf or close up photo of a leaf to base your brooch on and see what the shape is like and how the vein patterns are. Where can you get hold of this kind of tools and products? There are some online companies. I use a British company which has an online shop called The Identity Store. The instructions are in the next blog entry. Happy Crafting from Daisy and me! Previous New Logo, styles? Colours?